II‐VI Incorporated (Nasdaq: IIVI), a leader in laser systems, today introduced fiber-coupled visible lasers for biomedical instruments. 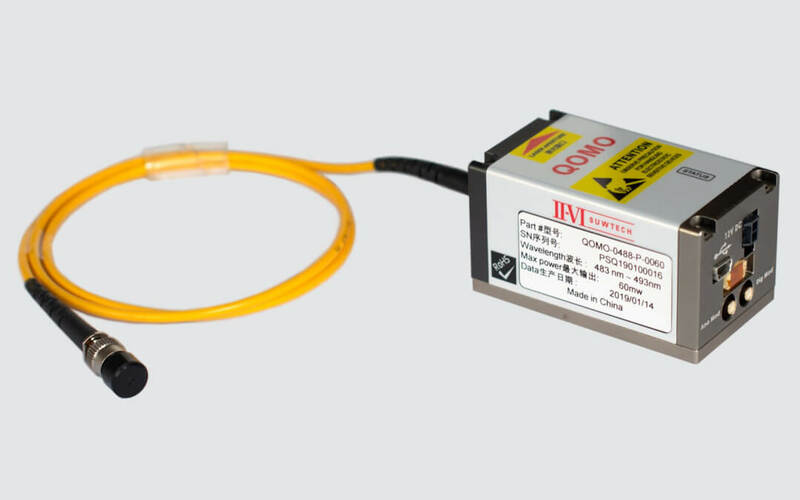 These fiber-coupled lasers are part of II-VI’s QOMO series of visible lasers, which are deployed in advanced biomedical applications such as flow cytometry, confocal microscopy and fluorescence spectroscopy. II-VI’s fiber-coupled lasers greatly simplify the integration, manufacturing assembly and field serviceability of analytical instruments, eliminating the need for customers to design, produce and assemble challenging beam delivery systems. The visible lasers are coupled to a polarization-maintaining single mode fiber that eliminates spatial mode fluctuations, consistently delivering a near perfect M-squared beam quality of less than 1.1, with excellent pointing stability and very low noise. The QOMO series of fiber-coupled visible lasers are available at 405, 488, 638 and 660 nm, with 30, 50 or 100 mW of power. II-VI’s broad portfolio of products for biomedical applications includes sheath cells, zero pixel shift filter cubes, optics and filters in the visible and ultraviolet wavelength ranges, and precision air and fluid temperature control systems based on thermo-electric coolers.